The term E-waste is applied to all waste caused by discarding electronic devices, especially consumer electronics. E-Waste comprises of old electronic and electrical appliances ranging from personal computers to various household appliances, such as TVs, refrigerators, cell phones, switches, wires, batteries and fluorescent lamps. Anything that has a wire, a plug, a battery or runs on electricity, that you probably arenâï¿½ï¿½t going to use ever again comprises of Electronic Waste. E-waste, as it is popularly known, includes the broad spectrum of electronic appliances, products, components, and accessories that due to malfunction, exhaustion (batteries, light bulbs and fluorescent tubes), or obsolescence have been discarded. This new form of waste is now one of the fastest growing waste streams around the world and needs imperative action today. E-waste is the by-product of the technological revolution. When disposed off in a landfill, it becomes a conglomeration of plastic and steel casings, circuit boards, glass tubes, wires, resistors, capacitors, fluorescent tubes, and other assorted parts and materials. It is both valuable as a source of secondary raw material, and toxic if treated and discarded improperly. Rapid technological change, low initial costs and even planned obsolescence have resulted in a fast growing e-waste crisis around the globe. Due to lower environmental standards and working conditions in China and India, the huge mass of e-waste is being sent to the third world countries for processing in most cases illegally. E-waste is of concern largely due to the toxicity of some of the substances if processed improperly. The toxicity is due to lead, mercury, cadmium and a number of other substances. A typical computer monitor may contain more than 6% lead by weight. Up to thirty-eight separate chemical elements are incorporated into e-waste items. The unsustainability of discarded electronics and computer technology is another reason for the need to recycle. We undertake Electronic Waste Recycling Services that is highly acclaimed for its timeliness and offering optimum worth. We are engaged in recycling electronic waste that includes various items, like refrigerator, micro oven, air conditioner, vaccum cleaner, LCD, CPU, mobile phones, computers, laptops, televisions, etc. 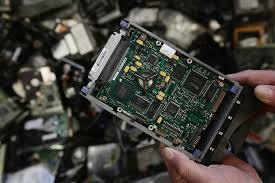 We provide maximum value to our clients with our Electronic Waste Recycling Services. Our Electronic Waste Recycling Services have environmental and social benefits, as the same appliance can be refurbished perfectly by us and can be sold again at reasonable prices.